Want to keep up with the Canon Professional Network on Twitter? Now you can! Just follow @CanonProNetwork for regular daily updates on product information, technical articles, Ambassadors blogs, tips and much more. Please note that we suspended download services for Firmware Version 1.1.0.1.00 that was posted Tuesday November 12, 2013 due to a discrepancy in color balance. We would like to apologize for the inconvenience. Firmware Version 1.1.1.1.00 corrects this color balance discrepancy. Any cameras that are running firmware version 1.1.0.1.00 should be updated to firmware version 1.1.1.1.00. Fixes a phenomenon where the previous firmware version 1.1.0.1.00 offered incorrect color balance. Ability to move the magnification viewing area around the LCD using the MAGN Function has been added. Support for a 1440×1080/35Mbps recording mode has been added. Functionality to support the optional Canon GPS Receiver GP-E1 has been added. Using the optional Canon WFT-E6 Wireless File Transmitter, the camera’s remote-control application allows two users to access the same unit via a Wi-Fi link providing simultaneous camera operation and control and metadata input. [Lens Exchange] and [ND+]/[ND-] have been added as functions that can be allocated to any assignable button. Ability to assign the two control dials to operate either Iris or ISO sensitivity independently has been added. Peripheral Illumination Correction Data has been added for seven (7) Canon Cinema lenses (EF mount) and fifteen (15) Canon EF Lenses. A function has been added to enable continuous focus and iris setting on a subject in the middle of the screen when one of the two EF STM lenses** is attached. **[EF-S18-135mm f/3.5-5.6 IS STM], [EF-S18-55mm f/3.5-5.6 IS STM]. *Note: Gamma information will not be shown correctly in the metadata of clips filmed on the Wide DR Gamma setting included in Firmware Version 1.1.0.1.00 and above when using the bundled software application Canon XF Utility Ver.1.3.1 or earlier. Therefore, we recommend our customers install Canon XF Utility Ver.1.3.2. The installer for this application has already been released. Please download the Canon XF Utility 1.3.2 for Windows or Mac OS X from the EOS C300 page. 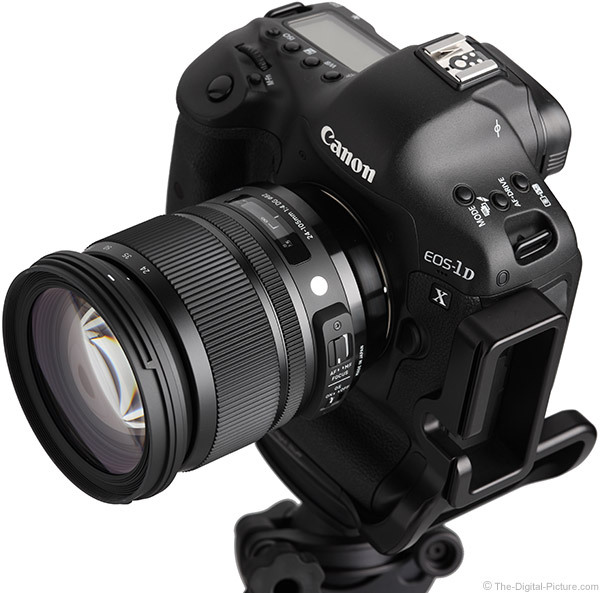 Please download the Canon XF Utility 1.3.2 for Windows or Mac OS X from the EOS C300 PL page. Adorama carries the Canon EOS C300 Cinema Camera. 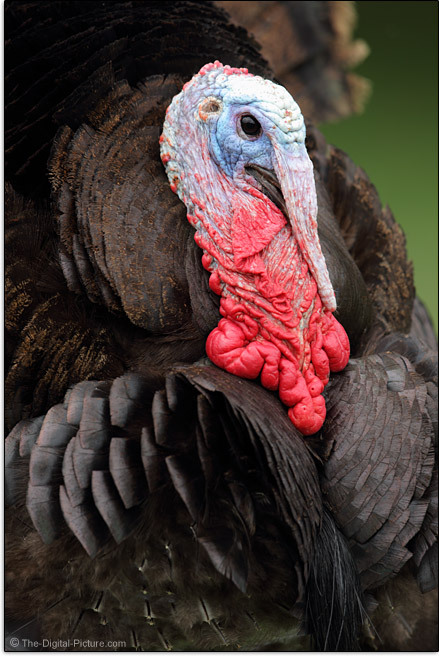 Those of us in the USA are celebrating the Thanksgiving holiday today. This holiday is set aside as a time to reflect and give thanks for the great blessings we have. If you are reading this post, you have at least something to be thankful for – minimally electricity, use of an electronic device and access to the greatest source of information ever developed (the internet). And you likely have FAR more reasons to be thankful. Regardless of the country you are in right now, take time out to reflect on what your blessings are and to give thanks. You are a blessing to my family and we wish you and yours a very blessed Thanksgiving! Thanksgiving is typically celebrated with family and friends – and a very large meal that often features a turkey and a lot of courses. Feel free to take an extra helping of desert for me. While I don't like that the big start of the Christmas shopping season coincides with this great holiday, I do love deals and deals typically come in abundance at this time of the year. Keep in mind that just because something is advertised in print at this time of year does not mean that it is a good deal. We will filter out the best DSLR photography-related deals to share with you. For the other deals you see, definitely check the price at Adorama and Amazon first. As always, we are very thankful for you and the support you give us here at The-Digital-Picture.com. We are especially thankful for the financial support provided by the use of the links on this site for your shopping. Start all of your Christmas shopping here! 348 new lens / camera combinations have been added to the DxO Optics Modules library, providing support for Canon, Nikon, Panasonic, Pentax, Samyang, Sigma, Sony, Tamron and Zeiss lenses for Canon, Fuji, Nikon, Olympus, Panasonic, Pentax, Samsung and Sony cameras. To see supported and planned combinations, click on the link below then select the second tab. Adorama carries DxO Optics Pro. Facebook Discussion: What do you anticipate most in the holiday season? What do you anticipate most when it comes to the holiday season? The food, the family, the fun, the gifts, the spirit? As for me, I love the varied and ample food that inevitably fills my grandmother's kitchen whenever my extended family gets into town. But there's something my family does that I enjoy above everything else - we play Rook (a card game) while catching up, snacking and laughing late into the night. Let us know what you anticipate most about the holiday season on our Facebook Page. Permalink: Facebook Discussion: What do you anticipate most in the holiday season? These are the results I've been anxiously awaiting: the ISO 12233 resolution chart crops from the Sigma 24-105mm f/4.0 DG OS HSM Art Lens. I used the lens a good amount over this past weekend and am really liking it so far. t’s time for our 4th Annual Black Friday Sale. This year, we are getting the party started early, 11 AM ET on Wednesday. You can get 25% off any rental placed at Lensrentals.com during the sale. Discount begins at 10:00 AM CT on Wednesday, November 27th and ends at 11:59 PM CT on December 2nd. Orders can be placed for any arrival date, as long as you actually place the order during the sale. Feel free to reserve the gear you’ll need in 2014 now, and take advantage of this deal. IRVINE, Calif. – Nov. 25, 2013 – WD, a Western Digital (NASDAQ: WDC) company and storage industry leader, today announced the release of the WD Black2 dual drive, a unique storage innovation that fuses a 2.5-inch 120 GB solid state drive (SSD) with a 1 TB hard disk drive (HDD) to offer a powerful dual drive solution. Perfect for consumers and service providers looking to upgrade notebooks, small form factor desktops, and single-slot and all-in-one (AIO) systems with both SSD level performance and HDD capacity, the WD Black2 dual drive connects through a single cable and fits into a conventional 9.5 mm slot. “Our customers told us they like our Solid State Hybrid Drive technology, but our tech savvy users asked for more control of where they store their data,” said Matt Rutledge, senior vice president of WD’s Storage Technology business unit. “The WD Black2 dual drives empower our customers to enjoy SSD performance and access high capacity storage in a no-compromise package. The WD Black2 dual drive is a direct result of our interaction with our customer base through WD Labs initiatives. WD devised its beta labs program to provide an exclusive testing arena for key customers and technology influencers of existing and emerging WD storage products." Designed for enthusiasts, creative professionals, gamers and PC builders, the WD Black2 dual drive provides improved overall drive capacity, performance, and reliability, while offering the flexibility to choose how and where their data is stored. Utilizing the benefits of both flash and magnetic disks, WD Black2 dual drives offload data usage from the SSD to the HDD, which increases endurance and life of the SSD. Users maintain greater data control, which can eliminate the need and expense of cloud-based storage. WD Black2 is free of caching algorithms and benefits from SATA 6 Gb/second interface speed. It is neatly packaged in a standard 9.5 mm, 2.5-inch form factor with legacy SATA connector, making the WD Black2 dual drive compatible with popular PC operating systems ranging from Windows XP to Windows 8.1. 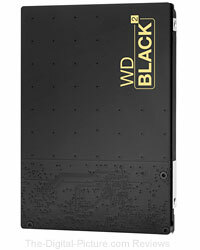 Available through authorized retailers, WD Black2 dual drives are covered by a five-year limited warranty. MSRP for the 2.5-inch 120 GB SSD + 1 TB HDD WD Black2 dual drive, model #: (WD1001X06XDTL) is $299.00 USD. Adorama is an authorized retailer of Western Digital products. The Sigma 24-105mm f/4.0 DG OS HSM Art Lens Review page is now loaded with eye candy. More information about this lens coming soon. 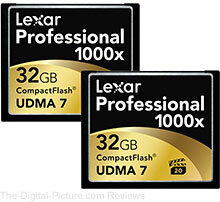 Adorama has special pricing on Lexar 2-Pack Memory Cards (CF/SDHC/SDXC). "This is The-Digital-Picture.com's Weekend Recap for the week ending November 23rd, 2013. On Wednesday, Sigma released firmware updates for all of its Global Vision lenses. The updates were necessary to allow Sigma’s Nikon-mount lenses to work properly with the newly announced Nikon D5300 camera. If you have a D5300 on pre-order, be sure to update your Global Vision lens’s firmware for full compatibility. Also on Wednesday, Nikon announced that it was the official camera of Walt Disney World and Disneyland Resorts. The agreement means that there will now be Nikon branded picture spots throughout Disney’s properties. On Monday, Bryan posted his Canon Super Telephoto Lens Shootout from Shenandoah National Park. In the article, Bryan gave his thoughts on using the Canon EF 200-400mm f/4L IS and the 500 and 600mm f/4L IS II lenses for photographing wildlife. Check out his post for more details. 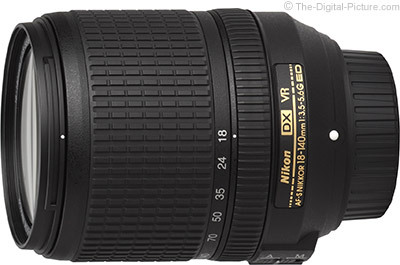 On Thursday, Bryan posted the Nikon 18-35mm f/3.5-4.5G AF-S Lens test results to the site. Lens tests added include image quality, flare, light fall-off and distortion. Lens specifications and measurements were also added. On Wednesday, we posted a great deal from Adobe where you can now get the Photoshop Photography Membership Program on Creative Cloud – that’s Photoshop CC and Lightroom 5 – for only $9.99 per month with no previous Photoshop ownership required. Previously, a version of Photoshop CS3 or later was required to qualify for this pricing. This has been the The-Digital-Picture.com’s Weekend Recap. Thanks for listening, and as always, happy shooting!" Roger Cicala Publishes "The Cynic’s Photography Dictionary"
Roger Cicala of LensRentals has published "The Cynic’s Photography Dictionary" for all of us to enjoy. Bokeh – the look of the picture in the parts where you can’t tell what you’re looking at. 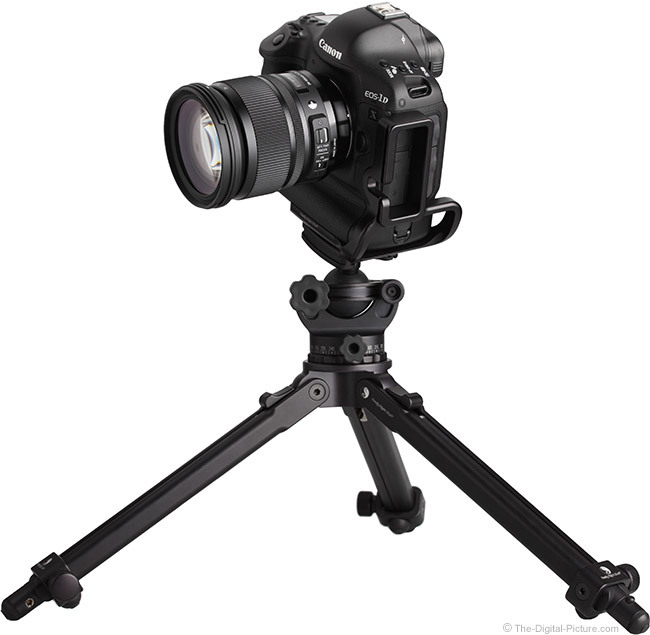 Image Stabilization – a technologic triumph consisting of lenses, magnets, position sensors, springs, and electric motors that is nearly as effective as 3 sticks of wood attached to a base plate. See also, Tripod. Lens coating — thin layers of of substances applied to clear glass that makes it clearer. In the 1600s people would be burned at the stake for claiming things like this. Sensor – The device that actually takes an image. Its most important attribute is the number of megapixels unless yours has fewer, in which case dynamic range, high ISO performance, microlens effectiveness, color accuracy, and other characteristics are more notable. Check out the the LensRentals Blog the full list of humorous definitions. Permalink: Roger Cicala Publishes "The Cynic’s Photography Dictionary"
How Far Would You Go To Promote Yourself? Action Hero, Anyone? In one of the most ambitious self-promtion schemes I have ever seen, photographer Jens Lennartsson created 400 action figures of himself to mail to prospective clients. Check out the photographer's website for a detailed walk-through of the promotion. Permalink: How Far Would You Go To Promote Yourself? Action Hero, Anyone? Standard test results, including image quality (ISO 12233 resolution chart sample crops), flare, light fall-off, distortion and measurements & specs, are now available for the Nikon 18-140mm f/3.5-5.6G AF-S DX VR Lens. CPN Presents "Inside Lightroom 5 (Part 5): Output Options"
Canon Professional Network has published part five of its five part "Inside Lightroom 5" series. "Examining the output options of Lightroom is the final part of this series, but it is equally as important as the rest. There are multiple output choices that we have available to us: options such as making books, creating web galleries or slide shows or just printing and exporting to social platforms (such as Facebook or Behance). This guide explains all of them and will give you a flavour of each option and how to use them to your advantage." Adorama carries Adobe Photoshop Lightroom 5. Permalink: CPN Presents "Inside Lightroom 5 (Part 5): Output Options"